The streak of different winners was broken at the European Grand Prix, when Fernando Alonso secured his second win of 2012 in front of his home crowd at Valencia. After two weeks off, Formula One returns to action at Silverstone, where we are still getting used to the new look circuit, and we anticipate plenty of rain to intervene with proceedings. What does the weekend hold, and who will be victorious? I can't answer those questions, but I can tell you everything you need to know in the lead up to the British GP weekend. Alonso's win moved him back into the lead of the championship, but the incredible season we have seen so far is keeping plenty of drivers in contention. Jenson Button has been struggling recently, and would love a home victory in front of the fans, but his teammate is also on an upswing of potential at the moment. Meanwhile, speculation continues over which Lotus driver could get a win first, if the team prove to be capable of securing first place any time soon. Support racing for this event includes GP2, GP3, HFO Historic and Porsche Mobil 1 Supercup. It will not surprise anyone to know that the weather for the weekend is forecast to be just a little bit wet. There are showers predicted through the whole weekend, starting from now. It will make quite a change from the Valencian location, where the sun was shining brightly in the clear blue sky. 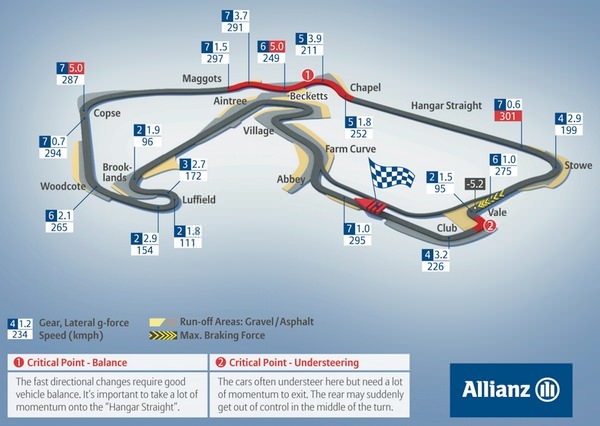 The run of single-DRS zones continues as Silverstone has both detection and activation in exactly the same place as last year, at the first serious kink in the track after the start, leading onto Hangar Straight. Last year, there was talk that Charlie Whiting had considered two zones, but overtaking was easy enough with the single zone. Drivers will be able to use the DRS until they reach the left hander at Turn 6. Silverstone has undergone some massive changes recently, but over the past twelve months things have been a little bit more stable. The only things to note are the entry to the pits being straightened, and the pit lane speed limit line moving up 50 metres. The track is longer now than its previous incarnation, and the drivers are still not quite convinced that the new Arena layout has improved things any. Almost 70% of a lap is full throttle, and one of the key things to get on top of is the high downforce levels required. The race will be a complete opposite to Valencia in terms of temperature, with the Silverstone circuit offering much lower degrees. Teams are expecting a three stop strategy to be the way to go. 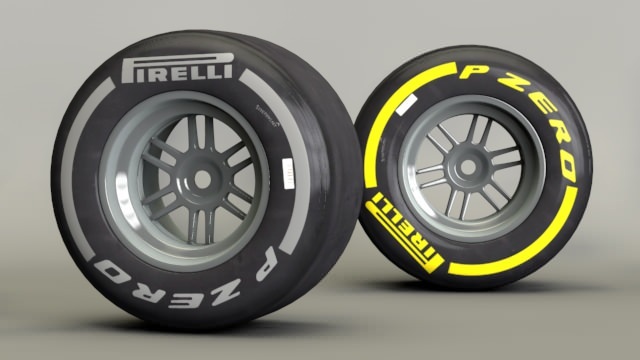 This weekend, Pirelli are giving teams a couple of extra sets of hard tyres for practice, hoping for some feedback on yet another experimental compound. Meanwhile, the tyres in use for the weekend proper are the hard compound (silver sidewalls) and the softer compound (yellow sidewalls). Silverstone is one of the most iconic circuits on the Formula One calendar, precisely because it is so demanding for the drivers, cars and tyres. This is why we have chosen to test a new experimental hard compound here during free practice, which we may use in the future. The new tyre has a slightly wider working range, which should make it easier for the teams to get the tyres into the right operating temperature window. But with the championship so finely balanced, our priority is to ensure that no one team is handed any particular advantage.